Today we will learn about abrasive jet machining principle, working, equipment’s, application, advantages and disadvantages with its diagram. Abrasive jet machining is a non-traditional machining process which is mostly used in machining of hardened metals. In this machining process a focus stream of abrasive particles are forces to impinge on work piece at high velocity. These high velocity abrasive particles remove metal by brittle fracture or erosion from work piece. This machining process works on the basic principle of abrasive erosion. If a high velocity abrasive particles strike on a hard or brittle work piece, it remove some metal at the striking surface. This metal removal process takes place due to brittle fracture of metal and also due to micro cutting by abrasive particle. 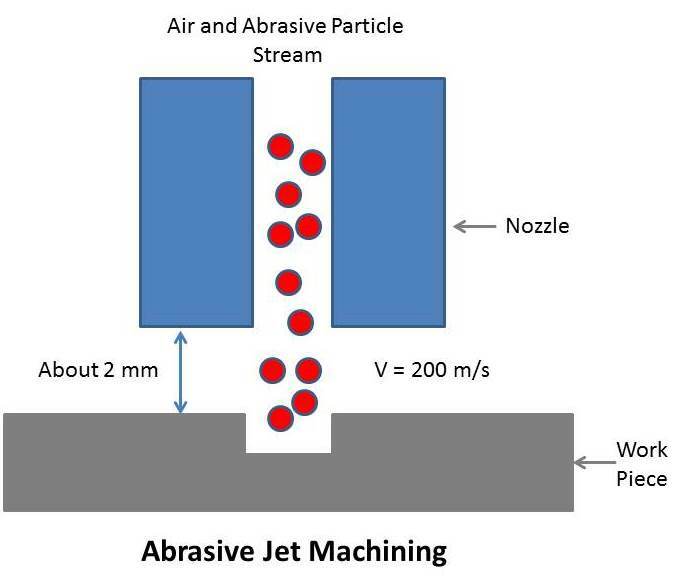 This is principle process of abrasive jet machining. The main purpose of gas propulsion system is to provide clean and dry, high velocity air or gas for machining. Mostly air, carbon dioxide, Nitrogen etc. are used as gas in gas propulsion system. This system consists, compressor, air filter and drier. The gas used in this system should easily available. First gas is compressed into a compressor. This compressed gas sends to filler and drier where all dust and unwanted particle along with moisture remove from it. Now these clean air send to mixing chamber. As the name implies, abrasive feeder is used to provide abrasive particles in mixing chamber. It is fed through a sieve which vibrates at 50-60 Hz and mixing ratio is control by the vibration of the sieve and its amplitude. These are the main particles which take part in machining process. These particles should have high metal removal rate and accuracy. The most common abrasive particles used are aluminum oxide, silicon carbide, boron carbide etc. The selection of abrasive particle is depends upon material of work piece, speed of machining, and machining environment. To direct the abrasive particle on work piece cutting nozzles are used. They are usually made by tungsten carbide. They are available in both circular and square cross section. Its life is usually low about 30 hours for tungsten carbide. It is fully closed air tight chamber witch control the concentration of abrasive particle around work piece. This is equipped with a vacuum dust collector which collect used abrasive particle and removed material from mixing chamber. The basic concept of abrasive jet machining is abrasive erosion or metal cutting by high velocity abrasive particle. Its working process can be easily summarized into following point. First gas or air is compressed into gas compressor. There the density and pressure of gas increases. Now this compressed gas send to filtration unit, where dust and other suspended particle removed from it. This clean gas sends to drier, which absorb moisture from it. It is used to avoid water or oil contamination of abrasive power. Now this clean and dry gas sends to mixing chamber where abrasive feeder feed abrasive particle in it. The abrasive particle is about 50 micro meter grit size. This high pressuring abrasive carried gas send to nozzle where its pressure energy converted into kinetic energy. The velocity of abrasive particle leaving the nozzle is about 200m/s. The standoff distance between work piece and nozzle is about 2mm. Now these high velocity abrasive particles impinge on work piece. These high velocity abrasive particles remove the material by micro cutting action as well as brittle fracture of the work material. This is working process of abrasive jet machining. It is used in drilling and cutting of hardened metals. It is used for machining brittle and heat sensitive material like glass, quartz, sapphire, mica, ceramic etc. It is Use to manufacture electronic devices. It is used in deburring small holes and some critical zones in machine parts. It can machine heat sensitive material. Initialization cost is low compare to other non-traditional processes. Thin section can be machined easily. Abrasive particle can embedded into work piece mostly in soft metals. Nozzle life is limited so it needs frequently replacement. Abrasive particle cannot be reuse in this process. It cannot use for machine soft and ductile material. 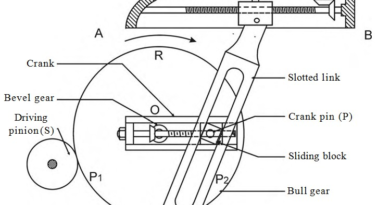 This is all about abrasive jet machining principle, working, equipment, application, advantages and disadvantages with its diagram. If you have any query regarding this article, ask by commenting. If you like this article, don’t forget to share it on your social networks. Subscribe our website for more interesting articles. Thanks for reading it.